Like most working folks, I need my drinks. On Mondays, to beat the blues. On Tuesdays, to drown the stress. On Wednesdays, to celebrate my ability to survive till the half-way mark. On Thursdays... Well, you catch may drift, I suppose. My usual buddy on these self-prescribed therapy sessions is none other than my trusty knuckle duster, I mean my Oris Pro Diver Chrono. Well, you never know when some drunken moron will drag you into a bar brawl, right? So, always go drinking well armed! How is this harmless timepiece possibly be a defensive weapon? Simple. Size matters. This may not be the largest watch on the market but it's the biggest I have that can fit comfortably on my poor excuse for a wrist. I bought this at a relatively decent deal from a local AD when I first caught the diver's watch infection. For a full titanium (both case and bracelet) piece, I must say the price I paid is a bargain (my apologies that I am bound by blood oath never to reveal the price I paid to anyone, except my family, best friends, golden retriever etc). This beast is by no means intimidating. Despite it's full titanium construction, it's not too light (unlike the Tudor Pelagos). It boast a pretty comfortable heft. Not too heavy, but just right. Sitting next to some of it's average sized stable mates, it looks quite a fair bit larger. For a watch of this girth, it is no surprise that it is reasonably chunky as well, about 18mm, actually. This, however, means it is not easy to tuck under shirt cuffs. In addition to a traditional uni-directional, it is equipped with a bezel lock system, which Oris officially dubbed it as the Safety Rotation System. The ceramic bezel can only be turned when it is unlocked by pulling the bezel upwards. to lock it, one simply needs to push it back down to snap it in place on the case. To ensure easy turning of the bezel, the design team have fitted a vulcanized rubber bezel ring as well. The bezel is a breeze to operate. It ratchets with confident clicks that lock the bezel in place with each turn. There is no free play at all. The vulcanized rubber ring is soft to the touch but yet rather hardy and durable, although it looks kinda plasticky. As it is made for professional divers in mind, it is not surprising to find a HRV on the case. Unlike the Rolex Deep Sea Sea Dweller, and the Seiko Sumo, the lug size to case diameter ratio is more proportionate - 28mm. 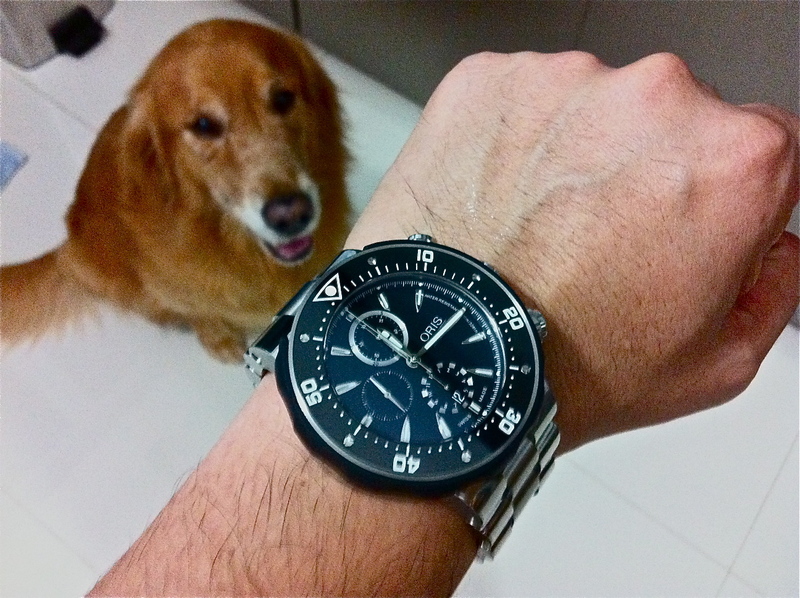 However, I echo the common gripe that almost every Oris diver watch owner share. The lug design limits the watch to using the proprietary bracelet and rubber straps. The dial is well laid out. The designers have made full use of the large surface area to arrange the sub-dials and indices properly to ensure legibility and ease of reading the dial, well almost. They got it right except for one area - the minute counter of the chronograph sub-dial at the 6 o'clock position. It's unnecessarily cluttered. The checker-board layout helps to a certain extent but I personally feel that alternating the Arabic markers would have made it less busy looking. The date window, in my opinion, should be placed in a less cluttered position instead of within the minute counter of the chronograph sub-dial at the 6 o'clock position. It would have been better at the 3 o'clock position. The dial features the signature wave pattern featured on most Oris divers. The depth rating is indicated at the 3 o'clock position on the dial. The fang-like sliver markers is another neat touch, in my opinion. It differs it from most of the other diving watches on the market. To ensure an absolutely tight seal, Oris has fitted screw-down pushers and crown. Despite the big, signed crown, the relatively huge crown is not easy to pull out. thanks possibly to some seals (o-rings) in the crown housing and the shoulders that act as crown guards. Note that the lugs are heavily curved. This is essential for big cases as it ensures that the watch contours as much to the wrist as possible. Straight lugs would make the watch a difficult fit for many. The case bace is engraved with the usual literature covering the basic specs of the watch as well as a meter/ feet scale. The brute of a case is fitted to a tapered titanium bracelet (screwed links) which ends in a signed folding single-lock clasp. The bracelet tis a mix of polished and brushed surface. The clasp features the requisite diver's extension which operates easily. The clasp is not the most awe-inspiring. It is operated by two pushers on each side of the main clasp housing. It unclips far too easily does not inspire confidence. As a professional diving watch, a double lock clasp, that can even be found on entry level divers like Seiko's offerings would have been more adequate. The lume is an awesome sight. Somehow, auqa-marine comes to mind. They look like bright turquoise neon sticks. Thanks to the curved lugs, the watch wears pretty comfortably on my insignificant 6 3/4" wrist. The watch comes with an additional rubber strap and strap changing tools. This is a handsome beast. Being large, and chunky, one has to be careful as they are natural ding magnets. However, it's well laid out dial and overall construction makes this a truly value offering. Don't leave for the pub without it! Movement : ETA Valjoux 7750. - Use of modern, high-end materials (full titanium, vulcanized rubber, ceramic bezel). - Bright and beautiful lume. - Avant-garde yet simple design. - Well laid out, uncluttered dial. - Bezel "Safety Rotation System". - Tight but easy to rotate bezel with no free play. - Clasp unclips too easily and doest not inspire confidence.- Ding and scratch magnet. - Chronograph minute counter too cluttered. - Position of date window.